Maine BEAR Basics - Does Bait Create Habituated Problem Bears? Does Bait Create Habituated Problem Bears? of food, leading to problems. They cite no direct evidence for this claim. Rather, there are some compelling biological reasons why this claim is false. Bait hunting, in fact, actually reduces conflicts. Let me explain how. In reality, only a small percentage of the bears living near bait sites actually approach the bait. Many are either not interested, or avoid the bait because of human odor, or do so only at night, after they know people leave. These shy and submissive bears exhibit greater human avoidance behaviors, which allow them to live long lives and produce many offspring. This also allows them to pass on their “good behavior” genes, and teach these behavioral characteristics to their offspring. By contrast, the most bold and aggressive bears are the ones that approach bait in daylight despite human odor, and consequently get removed from the population every fall by bait hunters. They are shot disproportionately to their relative occurrence in the population. The use of bait targets precisely the bears that have the temperament and potential to become problems. Another significant factor is that bears are “locational learners”. They have evolved over thousands of years to use locational clues to find food sources. Bears that find beech nuts on a ridge search other ridges for beechnuts; bears that find garbage and birdseed in a back yard search other back yards for garbage and birdseed. Bears that find bait in the woods might search similar wooded terrain for more baits, but they aren’t going to go to town looking for more. 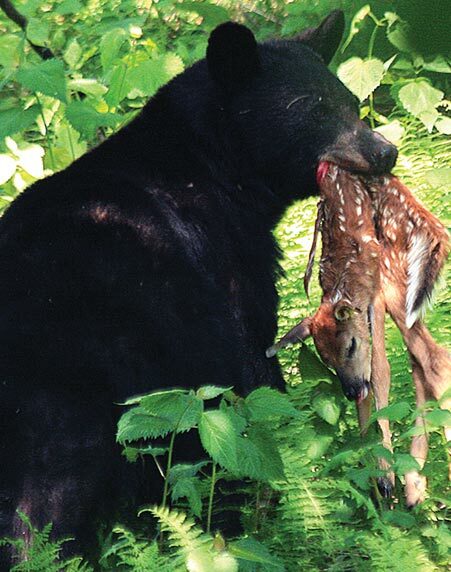 Simply, bears are not capable of associating baits with other human food sources. All a woods bear knows is that a food (bait) suddenly appeared within its home range in August and September. The bear exploits this food source like any that nature provides, like those beechnuts up on that ridge. Unless a bear already lives among people, it is incapable of searching out human habitation for this food. Bears will continue to search out the bait site for food only in the place where, and only at the time of year when, it occurs. Add to this the fact that the majority of bear baiting sites are located in Maine’s primary bear range, which comprises the heavily wooded northern half of Maine. Little bear baiting occurs anywhere near human habitation. Most bears targeted by baiting do not live near residential areas, even in rural areas. Bears are efficient predators of deer fawns and moose calves because they are “locational learners” and have discovered exactly where to hunt for hiding newborns. They would not look for them in your back yard – just as they would not look for bait there. Naaman Pratt photo. Hunting in general and bait hunting in particular reinforces a healthy fear of humans among bears and all sorts of dangerous animals, including wolves, coyotes, and mountain lions. Maine bears have been hunted for a long time, and are naturally wary of human scent, which is present to varying degrees at bait sites. There may be several bears in the proximity of any given bait site. They quickly learn the report of a rifle, and all the human commotion that ensues. Fear of encounters with man is what keeps bears out of your backyard. What drives the nuisance bear problem is loss of fear of man. This occurs over time, wherever hunting is outlawed over large areas. When hunger drives bears into human neighborhoods, and they are allowed to feed at bird feeders, gardens, pet food, or unsecured garbage containers without any negative consequences, marauding bears will habituate to this easy food source. In time, repeated experiences of “getting away” with foraging around people will cause bears to relax around people, exactly the opposite behavior that hunting elicits. Hunting and trapping minimizes nuisance bear problems, by reinforcing wariness among Maine bears and keeping populations in balance with natural food sources.